He calls on Elizabeth at once, but then avoids her for the remainder of Holy Week (the last week of Lent) that is supposed to be spent on recollections and self-denial. COLONEL Fitzwilliam’s manners were very much admired at the parsonage, and the ladies all felt that he must add considerably to the pleasure of their engagements at Rosings. It was some days, however, before they received any invitation thither, for while there were visitors in the house they could not be necessary; and it was not till Easter-day, almost a week after the gentlemen’s arrival, that they were honoured by such an attention, and then they were merely asked on leaving church to come there in the evening. For the last week they had seen very little of either Lady Catherine or her daughter. Colonel Fitzwilliam had called at the parsonage more than once during the time, but Mr. Darcy they had only seen at church. No doubt on Good Friday. The invitation was accepted of course, and at a proper hour they joined the party in Lady Catherine’s drawing room. It is Easter Sunday now, the day of Resurrection. During her visit at Rosings Lizzy ascertains that Darcy isn’t interested in Anne de Bourgh, while Darcy makes the most important decision in his life: he decides to propose to Elizabeth. He no longer runs away from her. On the contrary. He calls on her on the next day, and will continuously court her for nearly two first weeks of the Easter Season. In the meantime he puts off his departure from Rosings. Darcy, who already meant to humiliate himself by the marriage, is humbled by her refusal. The Agony in the Garden is the first Sorrowful Mystery of the Rosary (Rose Garden), it is then fitting that all of the events take place in Rosings Park. Roses encompass so many meanings, from the beautiful flowers to thorns; rose-bed, Wars of the Roses, compass rose, virtue, ease, success, bed of roses, or secrecy, strict confidence to name just a few. Naturally I don’t mean to suggest that Darcy is an incarnation of Jesus, but the analogy shows the importance of Darcy’s reformation. Easter is a symbol of new life. I have seen it said that Darcy could have fallen in love with someone else and be as happy as with Elizabeth. A view that strongly goes against the grain of the novel. It is important that Elizabeth is who she is, with her tiny dowry, lack of connections and awful relatives. It doesn’t matter for her that he is rich, but it’s of utmost significance for him that she’s such a nobody. Darcy is a decent man, but he’s guilty of pride, the worst of seven deadly sins. His pride is built on some of the worst premises possible: his wealth, connections acquired by birth, and his father’s achievements. Nothing speaking of his own true merit. This kind of pride doesn’t show in every circumstances, and doesn’t bother in many. His people still would be glad that he takes good care of them, his family and friends would be content with his style of life. Why then is it so bad? Worse than fornication, theft, and even murder. In his struggles Darcy shows signs of idolatry. He puts earthly goods over God’s law, forgetting that at the heaven’s door everyone is bare. As Mr. Collins said, Darcy is “one of the most illustrious personages in this land”, “blessed, in a peculiar way, with every thing the heart of mortal can most desire, — splendid property, noble kindred, and extensive patronage”. The problem with pride, the improper kind of it, is that proud people are ashamed to do what is right when they stand before the risk of humiliation. They will not endanger the source of their pride lightly. They follow false gods, and Darcy is guilty of it during the most important time of Christian year. He can successfully go on in this manner till the end of his days, but he won’t be granted salvation. Darcy proposes to Elizabeth and is ashamed of it. He’s ashamed of having loved such an improper girl, and would be ashamed to be married to her if she agreed. As he said at Netherfield: “it has been the study of my life to avoid those weaknesses which often expose a strong understanding to ridicule”, and now he knows that he’s going to ridicule himself in the eyes of his peers by doing what he thinks is right, but what will not appear to them as such. Everyone has his own cross to bear, and Darcy’s, in the Easter season, is Elizabeth. He could have fallen in love with Anne de Bourgh to the joy of his family, friends and perhaps even his own. He could have fallen in love with another woman of high birth and extensive dowry. But instead he fell for a girl that is so universally unsuitable, that is, with the exception of her self. Everything she is, her personality, character, principles, manners, beauty and accomplishments, is what suits him best, but not what she represents in the society. He could be the happiest of men if he married her, if not for the shame the union would be in the eyes of others. He’d then be more than happy to forget about her and move his feelings elsewhere, by that solving his problem easily, but he cannot do what is easy. He cannot get rid of his cross, because his passion for Elizabeth is too strong, and that’s what haunts him. He has to choose the difficult path against his wishes. Yet, if he had fallen in love with someone else, even the best woman in the world, his pride would never be challenged and conquered. He’d marry and never be happy with himself and his own life, because he’d lack the courage to do what is right whenever circumstances called for it. No man’s will is free if he’s kept hostage by his own pride, and that’s why pride is the one sin from which all others arise. Thanks to Elizabeth Darcy learns to have the guts to choose, do and appreciate what is right in the broader scheme, against the views of his peers. At the end the opinion of his family doesn’t matter. He’s no longer ashamed even to become Wickham’s brother. When Elizabeth learns of his actions and feels proud of him it’s the best kind of pride, the one that is entirely to his own merit. I heard it said that April must be a fateful month for Darcy. I think it very unlikely. He learnt a lesson, “hard indeed at first, but most advantageous”. Darcy is too intelligent to not appreciate such a valuable gift. Even if he never met Elizabeth again, the lesson would be learnt. He was a good landlord, master, nephew, cousin, friend and brother, but thanks to Elizabeth he was taught how to be a good man. No one can be happy without it. It is impossible to be proud and good at the same time. Whenever he’d make a difficult choice, choosing what’s proper over what’s right, he’d feel guilty, and this guilt would eat him with time. He already did that when he concealed Jane’s presence in town from Bingley (because she was so unsuitable), and he knows it was beneath him. If he chose otherwise he’d feel ashamed, and this shame would make him resentful. Mr. Bennet is ashamed of having married his wife, and he takes a life long revenge on her for it. There’s no integrity in proud men. 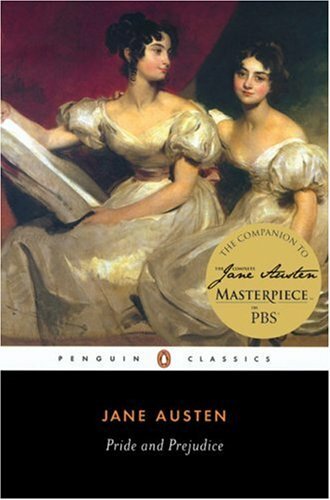 It is very difficult to lead a good life when one cannot appreciate oneself for it and is not appreciated by others, and Darcy was not, until he met Elizabeth for whom he and his actions mattered more than his public image, and for whom he had to reject the pretence in order to not be ashamed of her, but appreciate her as the woman truly worthy of it. Elizabeth about Darcy to her father. * I snagged the Philip Gough‘s illustration from Laurel Ann at Austenprose. I love that the author forgot about Colonel Fitzwilliam. It shows that when Elizabeth and Darcy are together everything else is easily forgotten.